To read a question and answer FAQ on the book, follow this link to the Thunderbird and the Ball of Twine page. Thunderbird and the Ball of Twine (A Folk Tale) takes up, in the enigmatic mechanics of the universe department, where Unending Wonders of a Subatomic World (and) The Search for the Great Penguin leaves off. Different characters, different situation, same author. I write what I know, and what I know is…strange. Odile McDonald sees a UFO moments before Johnnie Jackson, in his wonderful golden Thunderbird, trashes her little Kia. The UFO is the pearl of light nexus from which the rest of the story, leading up to then speeding beyond, radiates. Well, speeding beyond as best as one can in two cars that are totaled. You’ve probably never seen Fantastic Voyage, but think of the UFO as Glenda the Good Witch meeting Odile and Johnnie in the middle of a tornado and sending them to the Witch of the West for the slippers that will get them back home, which necessitates Johnnie and Odile being shrunk down, like Raquel Welch and that submarine of hers were shrunk down in Fantastic Voyage, and injected into their very own brains. That’s an analogy. But it’s just…like…that. Into every life a seeming nemesis must creep, if one is to have an opportunity to evolve or dissolve, whichever way the narrative blows, and on the shore of his consensual reality world, spyglass to eye, Johnnie Jackson had watched and waited for the dot of a black flag ship to appear on the horizon, the telltale flotsam and jetsam of its existence having already swamped his beach. Then his golden Thunderbird collided with Odile McDonald, who had just been sideswiped by a UFO. Insurance information exchanged, down that dark alley between respectable, upright science and sly, illegitimate synchronicity, they each turned and limped away. What does it mean when your horoscope says your life is over? A comedic philosophical quest and serious inquiry into the fool’s journey, Thunderbird and the Ball of Twine, a Folk Tale explores the fragility of our conclusions on being and consciousness when based upon the fragmentary sharing of experience and elusive, illusive perspective constrained by the regulating thermostat of cultural expectations. The paperback version is on sale at Lulu. It will eventually be also at outlets like Amazon, but it’s cheaper at Lulu. 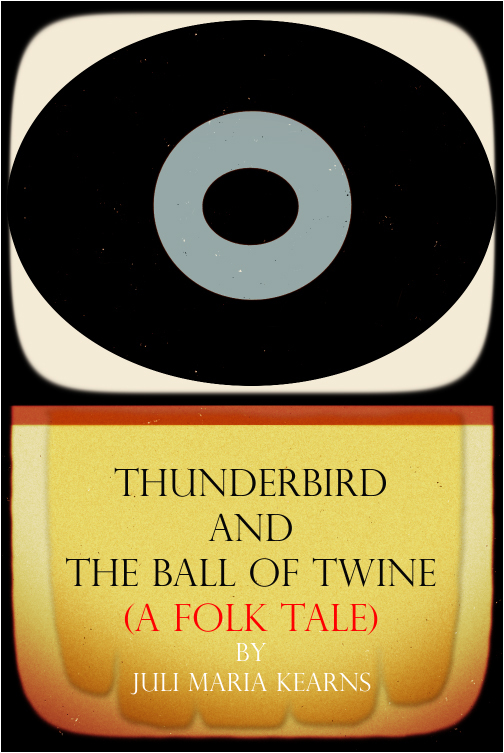 Thunderbird and the Ball of Twine (a Folk Tale) is also available as a Kindle ebook at Amazon. I’ve done my best to make the Kindle ebook an attractive reading experience, but the cover on the paperback edition looks awesome and the interior is nicely formatted–a lot of thought went into it–and is going to make for a more aesthetically pleasing read than the Kindle version. I invite you to please purchase and post a review. The table of contents and a short selection from the book can be viewed below and at Lulu. For some reason the cover looks horrible in the Preview mode at the link, when in physical reality it is gorgeous. POST A REVIEW!!!! THUNDERBIRD wants your reviews. Post at both Amazon and Lulu.